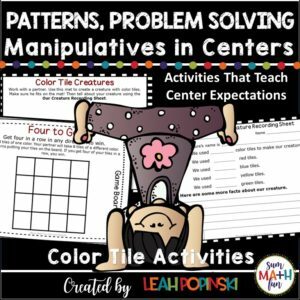 Addition and Subtraction Centers: 44 pages packed with 8 different addition and subtraction center games and activities! This packet includes a variety of approaches to adding and subtracting using strategies, algorithms, properties, and relationships. Multiple visual supports and formats are used to engage a wide variety of learners. ✎There are games for concepts, facts, review, and practice + posters for Essential Questions, Enduring Understandings, and I Can Statements. Detailed teacher notes, tips, and ideas are included, too! 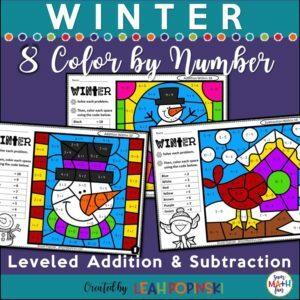 These addition and subtraction activities are designed to engage your students in meaningful practice allowing you to run small groups that maximize student learning. Simple prep will save you hours – just print, laminate or use sheet protectors and use year after year. 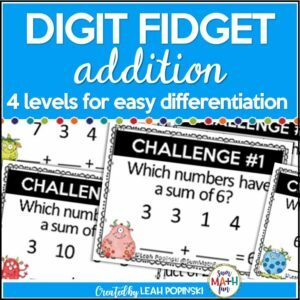 Addition Extension – 3-Digit Addition with Regrouping Center – This can be a matching or memory game. Students add 3-digit numbers on task cards and match them to their answers. A recording sheet is also included for students to write their answer as a record of their work. 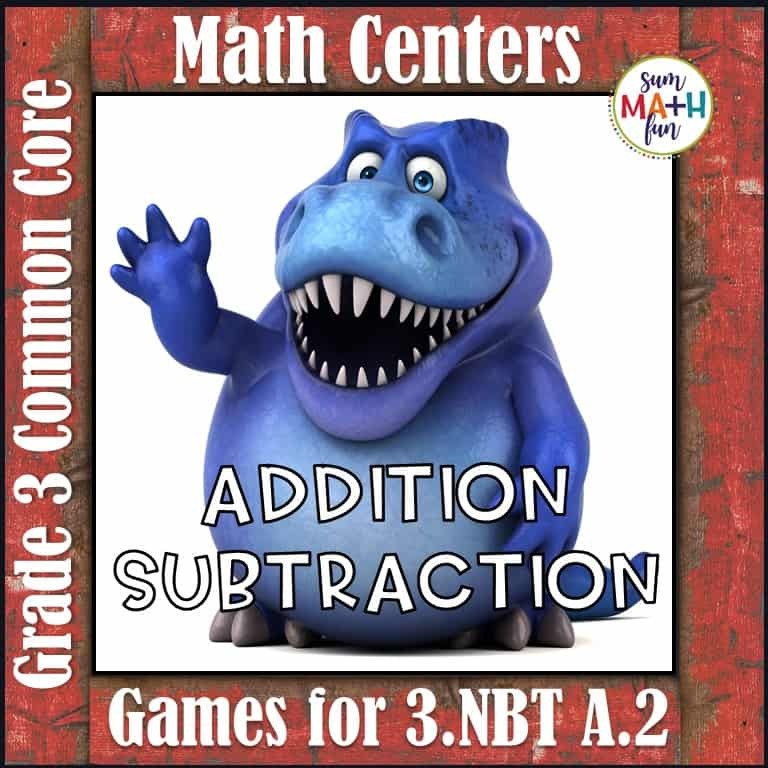 Triceratops Subtraction – 3-Digit Subtraction With Regrouping Center – Students find the difference that completes each equation on the task cards and match it. There is a recording sheet also included for their answers. Spiny Subtraction – Subtraction with 0(s) in the minuend – This matching game focuses on “subtraction across 0s”. It is a wonderful game for those students who are still struggling with this skill. Very helpful and the kids love playing it. It can be played individually or with a partner. Mesozoic Missing Addends – This 3-Digit Missing Addends game will be helpful for students practicing mixed addition and subtraction using patterns and relationships. This matching game has the “unknown” as either of the addends. RAWR-ing Over 1,000! – A student favorite! 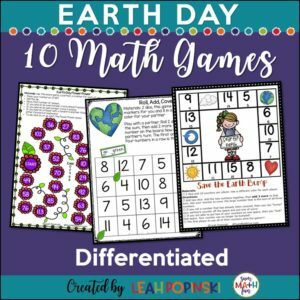 This fun and engaging game will have your students using addition and subtraction as well as number sense. In this game, students add two three-digit numbers to get as close to 1,000 as possible without going over. In order to determine who is closest, students must also use subtraction. This is a great game for approximating sums, place value, higher order thinking skills, and probability. Print and go recording sheets are included, but this can also be played on write-wipe boards or in student notebooks. Catastrophic Capture – Another favorite! This is a board game for partners. Students use strategies to fluently add and subtract within 1,000. To play, students add or subtract 15 to the number they spin. They capture (cover) a space that has that sum or difference. To win, they must be the first to Capture Four In A Row! Cover the Dinosaur – Such a fun one! Students use strategies and place value to add and subtract. They roll a die and move that number of spaces. They find their answer on one of the dinosaurs in the center of the game board and cover that dinosaur with a counter. If they land on a “Lucky Dinosaur”, they get to cover any dinosaur! The player to cover the last dinosaur is the winner. Build a Dino! – This is one of my favorites. I love seeing the strategies students use! For this board game, students add and subtract 25, 50, and 75 (think quarters!) within 1,000. They place the Build A Dino game cards upside down in a stack, then turn over the first card and find its match on the game board. The winner is the player who is first to complete a dino picture. ♥ Great for homeschooling families too! Word Problems – 3rd Grade Multi-Step – Common Core Aligned – Bundled! Thanks for taking your time to peek inside this resource! ***Just a friendly reminder that this product is for A SINGLE USER ONLY. That means that copying or sharing any part of this product with another teacher, grade level, school, department, district, etc…is strictly prohibited. You have the option to purchase multiple licenses (at a discount) for each additional person/classroom with whom you wish to share this product. Thank you for respecting my hard work!